Here’s a cool new opportunity to make some extra money! you could be a good fit. 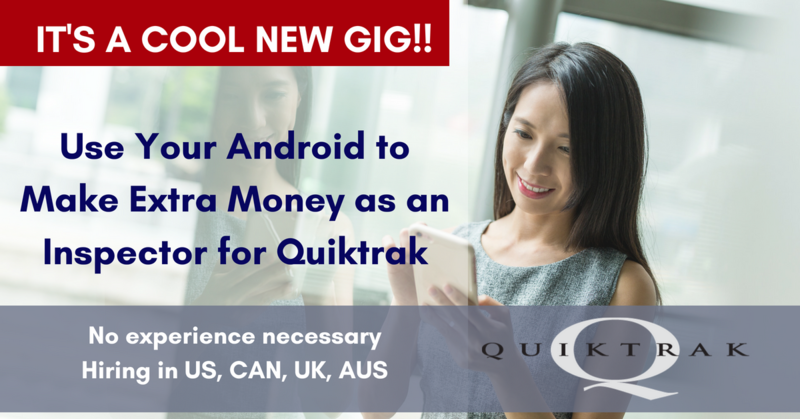 Quiktrak is looking for people across the US, Canada, UK and AUS to perform inspections for them and their clients. The company enlists the aid of independent contractors to perform Floor-plan audits and Leasing Inspections on an as-needed basis. Inspections typically include doing things like photographing business equipment, locating and checking serial numbers on equipment, and making notes about any damage. As this is contract work, volume is not guaranteed, and it is part-time. According to the company, inspections generally take between ten minutes to two hours to perform. Contacting businesses and scheduling inspections within given timeframe. Traveling varying distances to conduct inspections. Utilizing Revoquest software to complete reports. Identifying equipment, locating serial numbers and documenting any damage. Photographing equipment, the business and any serial numbers. Interviewing the business contact individual following the inspection. Submitting completed reports within given timeframe. Must obtain, or be willing to obtain, an Android-based cell phone or tablet. Have a flexible schedule, including weekday business hours. Have professional business appearance, demeanor and good communication skills. According to their documentation for US contractors (sorry, I don’t have details for the other countries), the base pay rate per location is $25. More complex inspections pay at a higher rate. There is also a “per unit” additional pay and travel compensation. For full details, click here. For more jobs and gigs, see our Newest Jobs & Gigs page. We post new leads every day except Sunday. Good luck in your work from home plans! This entry was posted in Earn Extra Cash and tagged Quiktrak. Bookmark the permalink.